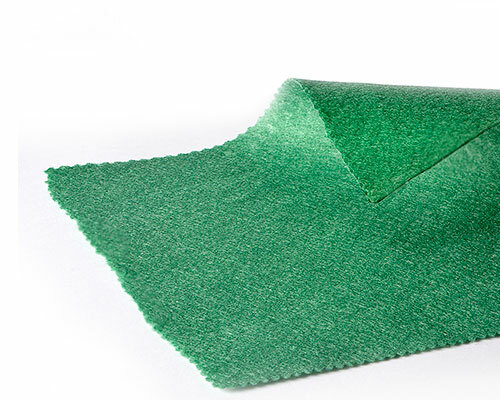 Air permeable nonwoven membrane in green or black polypropylene fibre for the protection of fodder, hay and for covering wood chip and compost mulches. Hydrophobic water run-off assured with 45°gradient or greater; does not absorb water. Highly air permeable perfectly calibrated porometry ensures optimal air permeability, preventing the formation of condensate inside the membrane and simultaneously allowing the egress of vapour and fermentation gases. Tensile strength: high resistance to tearing, tensile stress and possible animal damage. Non-toxic, mould resistant: composed of premium quality synthetic material derived from polyolefin polymers, specifically polypropylene, with almost total chemical stability. Optimal anti-mould properties. Wide choice of sizes and roll dimensions, produced specifically to order, with fast delivery times. Repairability: easy to repair by the application of patches in the same material using silicone adhesive. Durable: estimated lifetime of approximately 3 years in temperate climates. Reversible: can be used on both sides. Customization: The product can be customized on request, with bespoke roll sizes, weights and surface finishes. Is a UV stabilised, hydrophobic and air permeable membrane in green or black polypropylene staple with weight of 300 g/m². Ideal for covering and protecting wood chip mulch and for maturing compost. Is a UV stabilised, hydrophobic and air permeable nonwoven membrane in green or black polypropylene staple with weight of 165 g/m². Ideal for protection and wrapping of round bales, and for covering straw and hay stacks.